What makes a security system powered by Sting Alarm Las Vegas and Alarm.com “smarter”? A security system keeps you safe by signaling for help in an emergency. Unlike traditional systems that piggyback on your cable or phone connection, Sting Alarm Las Vegas uses a dedicated, reliable cellular connection. That’s smarter because it can’t be cut with wire cutters, or taken out by a falling tree. Sting Alarm Las Vegas is a better lifeline for your home. Traditional security systems are controlled at the wall panel. You can control an Alarm.com system with your phone, with a smartwatch, and even with your voice, which makes it easy and convenient. You can also interact with it from anywhere, checking in via video, for example, or answering your front door while you’re at work. It’s smarter because it gives you way more value. Sting Alarm Las Vegas takes proactive measures to protect you in emergencies. If your system detects smoke, it sounds the alarm, turns on your lights and shuts off your HVAC. If there’s a water leak, it shuts off your water. If there’s a break-in, our professional monitoring station is alerted and the police are dispatched to your home. That “smart home” you hear so much about? A Sting Alarm Las Vegas security system gives you everything you need to have one. Your dealer can add a smart thermostat, a smart doorbell, video cameras, smart locks and lighting, smart garage doors and more. 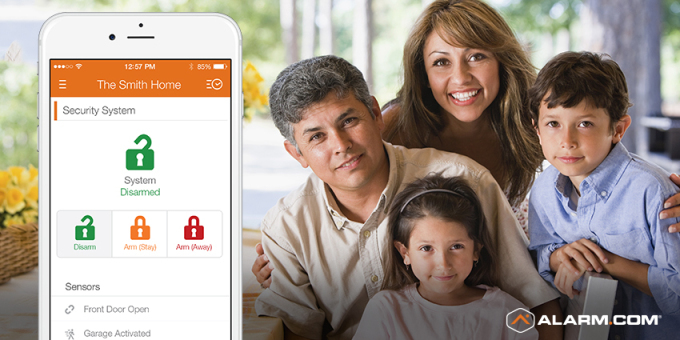 Every device is controlled through the same Alarm.com app, and the security system makes them smarter by having more sensors communicating with each other throughout the home. Unlike most “smart” technology, you don’t have to install your Smart Security System by yourself. A Sting Alarm Security Specialist will make sure that your Smart Security System and other smart devices are installed properly.